Do you ever wonder what food trends will look like a generation from now? I guess I’m never surprised that artistic trends so often change, like in fashion and music and film. But it’s so interesting to me that the food on our plates also so dramatically evolves from generation to generation — in part because of the artistic and creative side behind the culinary “arts”, but also because of the hundred or so other factors from sustainability to cultural influences to technological innovations and so much more. Things are constantly changing, that’s for sure, but I kind of love that. We could live in a world where our basic sustenance has been the exact same for thousands of year. But instead, it’s something we’re still exploring and learning about and getting creative with day after day, year after year, decade after decade. Pretty cool. Anyway, no grand conclusions here. But I was thinking about this the other day as I picked up a bag of brussels sprouts. Yeah — remember when those were like The Most Dreaded Food Ever a generation ago? And now they are oh-so-popular and everywhere? I certainly never would have guessed 20 years ago that roasted brussels would turn into one of my favorite side dishes. And seriously, I never would have even guessed 5 years ago that I would love eating them raw in a salad! Times change. And at least with this recipe, I’m so glad they have. 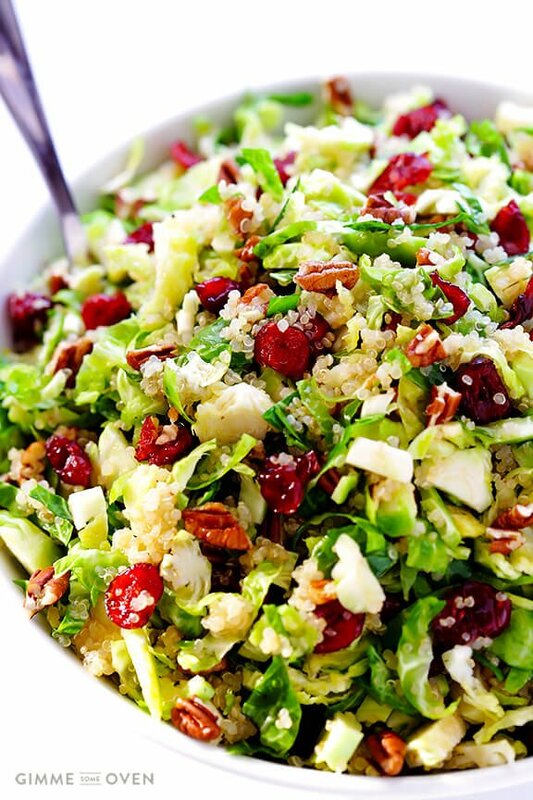 Have you tried shredded or “shaved” brussels sprouts in a salad yet? I started buying them at Trader Joe’s a few years back and was instantly hooked when I found out that you could actually eat them without sauteing or roasting them. They are so good!! And they basically function just like cabbage in a slaw once they’re shredded. 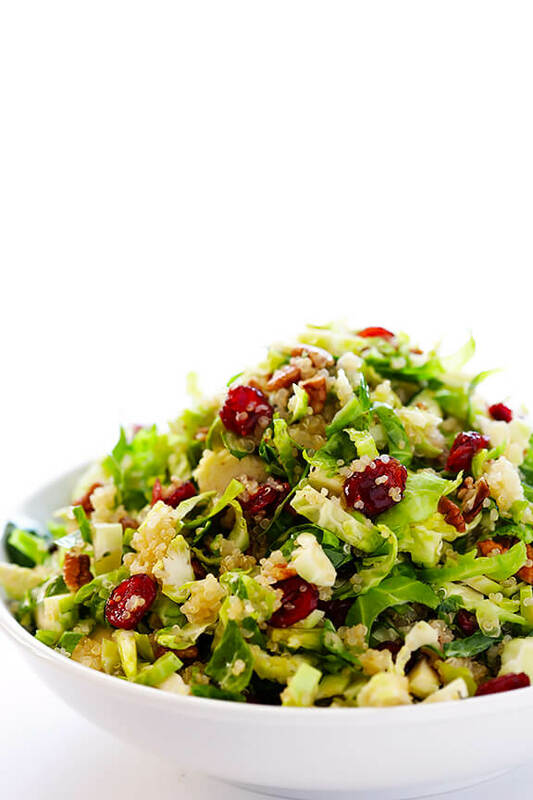 So to get in the holiday spirit with reds and greens, I decided to whip up a brussels sprouts and cranberry salad for the holidays this year. And then for a little extra protein, I also threw in some quinoa and pecans. And then since oranges and cranberries are a match made in heaven in my mind (and also in this recipe and this recipe), I tossed the salad with a very light orange vinaigrette. And voila! 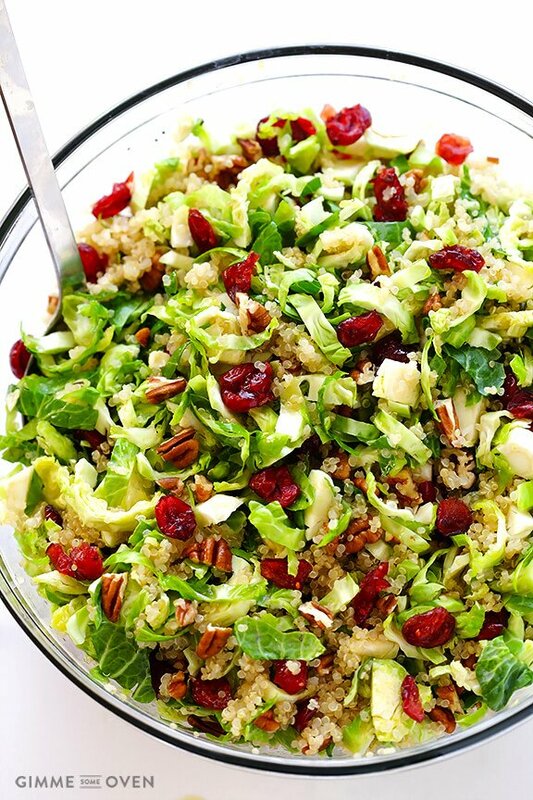 The most beautiful, light, holiday salad — which also happens to be vegan — was born. And even with shredding my own brussels, it was ready to go in the amount of time it took to prepare the quinoa. Easy peasy. And SO good. Long live the brussels sprouts trend!! 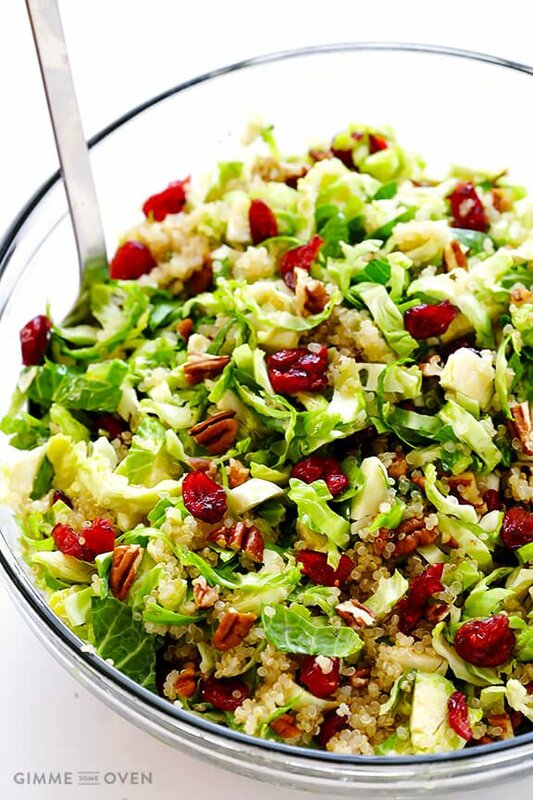 This Brussels Sprouts, Cranberry and Quinoa Salad is simple to make, naturally vegan and gluten-free, and wonderfully light and delicious! 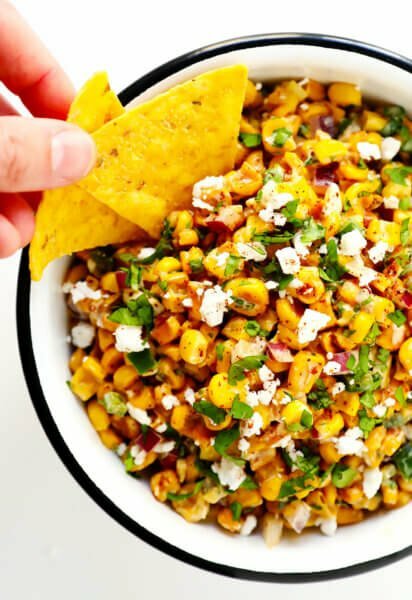 Toss all ingredients together until combined. Came across this recipe and decided to make it for a big family birthday dinner a few weeks ago. I was a bit worried because my family is not necessarily adventurous and was worried I’d lose them at brussels sprouts. But to my delight the salad was a big hit with everyone! The only addition was a squeeze of honey to the dressing. Now I’m planning on making this for my in-laws and extended family for the holidays and am sure they will love just as much! I’m not much of a cook, so this might be a dumb question…do you cook the brussels sprouts or are they raw? Are there any nutrition values for this recipe? Hi Sabrina! We’re sorry but we are unsure of the nutrition facts/amount of calories in this recipe. We currently are not publishing nutrition facts on the site, as the nutrition calculators available are not 100% accurate, and we never want to publish anything that might be misleading. However, a lot of our readers love the My Fitness Pal nutrition calculator, so feel free to try that for an estimate. We hope that helps! Absolutely Delicious! Thank you for the recipe! 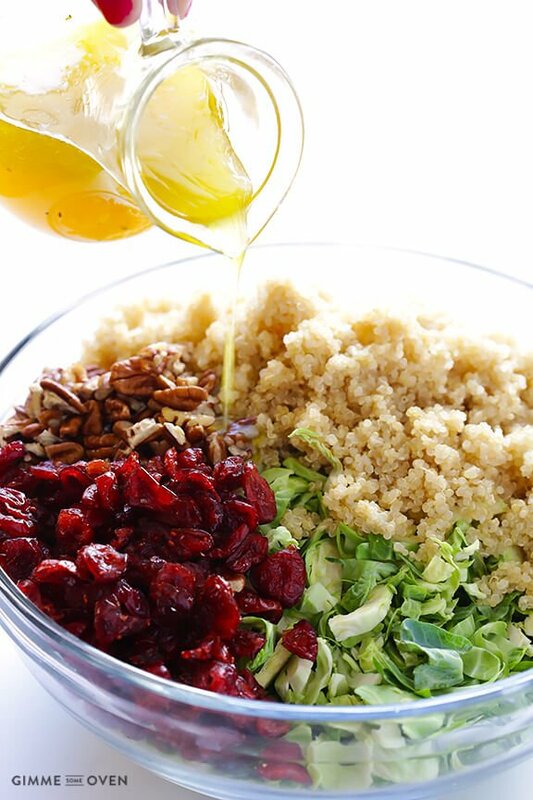 Did you use plain dried cranberries or sweetened dried cranberries? Wow!!! This is AMAZING!!!!!! I forgot the pecans, but it was still delicious!!! Thanks for sharing this recipe!! Looks yummy! Does this keep well in the fridge? Thanks! It’s one of those things that’s kind of best the day you make it, but you can certainly refrigerate it and re-heat if you like to eat it warm like we do — we hope you enjoy! I am TOTALLY, 1000% NOT a Brussels Sprouts fan, but I am trying this tonight as I know they are healthy for you and since they are raw and supposed to taste like cabbage (which I enjoy), I thought I might like this salad. I love cranberries, orange juice and nuts, and I’m just starting to learn how to cook with quinoa. So, here goes nothing……. Okay…..time for some dessert….a little humble pie…..I’m a convert. I like this! I think it gets better the longer it sits but I think the next time I make it, I will add a bit less vinegar and a bit of warmed honey to the vinaigrette. Yes, I said it, I like Brussels Sprouts as long as they are raw. Hi Christy! Yes, we think you could definitely use peanuts in this. We hope you and your husband enjoy! So, I’m not a big salad person at all, but I LOVE Brussels sprouts, and I am a terrible person and never leave comments on recipes but this salad was so unreal and kept me full for HOURS. Definitely going in my favorites. Thank you for making this so I can find a salad that I love!! This looks really healthy, always looking for ways to use quinoua, thankyou for sharing the recipe. I had never made quinoa before, and if you are also one of those people, you may want to know that it swells up when cooked. I didn’t see it on the package anywhere or on the recipe. My advise would be to measure about 2/3 of a cup raw quinoa to get the 2 cups of cooked. The recipe, other than that, was good. I cut up a naval orange and added it to the salad to give it a little more flavor. This was a good change from my standard salads – thanks! made a variation of this with stuff I had in my pantry (cooking without planning a trip to the grocery store is always a beautiful thing)- barley and pumpkin seeds instead of quinoa and pecans, and I used some fresh chopped kumquat (with some lemon soda to thin it out) instead of orange juice. Turned out great! What do you normally pair this with? Sometimes we’ll eat it on its own, as a meal (it’s great for lunch)! You can also add some shredded roast chicken to it for some added protein. If you want to eat it as a side, it can really go with anything, though we feel like it’s more of a fall/winter meal. :) We hope this helps, and that you enjoy! My new favorite salad! I’ve been bringing it to work in a small mason jar and it’s been the envy of my coworkers. 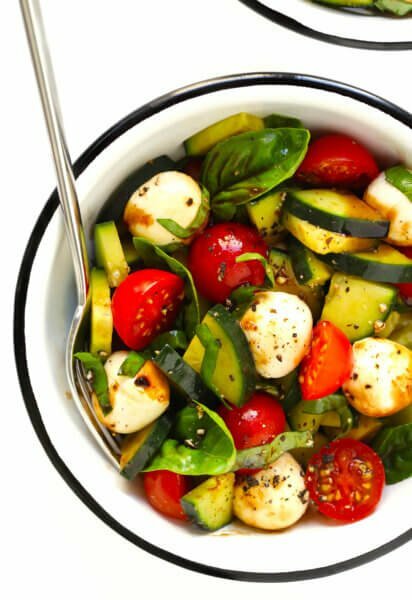 Tossed with a little goat cheese – super yummy! Also love it as is :) Sometimes it’s hard to wait until lunch! You know what would’ve been nice to know before starting this recipe? The Brussels sprouts must be FRESH, NOT FROZEN. When I saw “Trader Joe’s” and “brussel sprouts,” I assumed that I could use the frozen variety, because that’s what I’d always used. And 2:1 water:quinoa ratio?! Only if you want it soggy. 1.5:1 gives you the fluffy, separated grains. Hi Jake — when listing vegetables in a recipe, if it doesn’t specify “frozen,” then we mean fresh. After my frozen sprout debacle, I bought some fresh sprouts. To minimize GI discomfort, I cored each sprout — a time consuming process. Also, the dressing’s very sweet. It needed a full 24 hours, plus some periodic tossing to marry the flavor with the produce. To help offset the sweetness, I topped the salad with some crumbled feta flavored with mediterranean herbs (I forget the brand). That really “made” the dish. Still, I and a friend experienced some bloating after eating it. That’s it — no more raw crucifers for me! I’ll try it next time with Napa cabbage and see if it’s kinder on the digestive system. I made a few modifications but this is YUMMY!! I hope I did the recipe justice but i lightly sautéed the brussels as I prefer cruciferous veggies to be cooked, omitted the quinoa (I’m doing low carb at the moment) and subbed pecans for the walnuts in my pantry. I’m in love. Thank you!! This is yum! Had for mother’s day and my niece put cashews in…so Good, skip the pecans….I like a lot more dressing so will double recipe. Also thought about roasting brussel sprouts, but not completely. Will comment on my experiment! We’re happy you enjoyed it Mary, and we bet it would be amazing with roasted brussels sprouts — yum! Hey could u use coconut oil in this recipe? Thank you so much for this recipe. I belong to a cookbook club & have been looking for this recipe to take to our next get together, which is tomorrow evening. Can I make this in the morning for that evening? You’re very welcome, LouAnn! We hope you and your friends enjoy this! And yes, you could make it in the morning for that evening (though we would probably recommend keeping the dressing separate and then mixing it in right before you’re ready to serve. Hello! I’m considering making this recipe for a family get together and I think k it has a nice variety of ingredients. 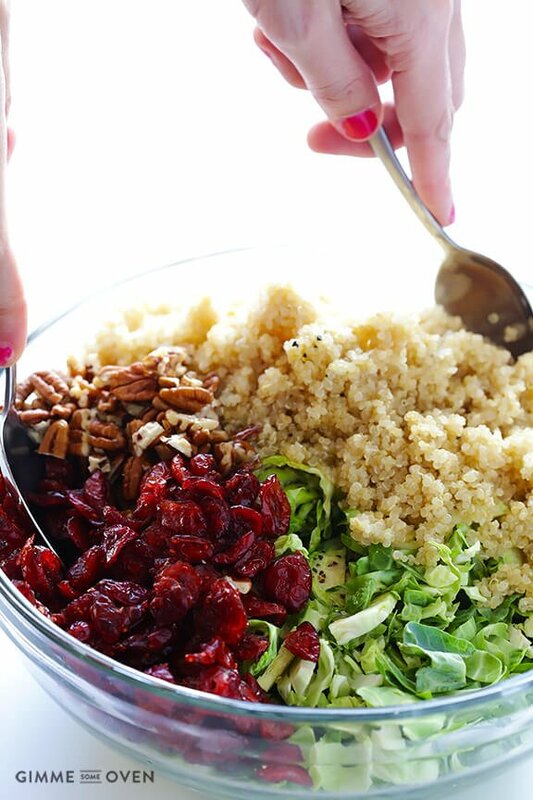 Do you have a recommendation for what to cook the Quinoa in for this recipe? In water, chicken broth, vegetable broth or beef? Just wanted to see if you had a specific method for this recipe in particular. Thanks in advance! Hi Meredith! We usually just cook our quinoa in chicken or vegetable broth/stock, though water is also fine (we prefer stock/broth because it adds more flavor). We hope you and your family enjoy! Hi there! This looks delicious! 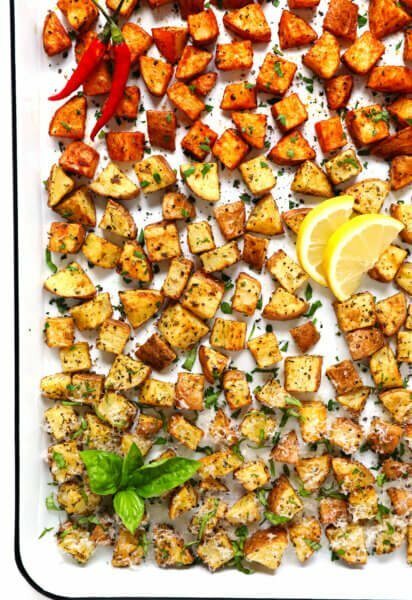 If I am wanting to bring this to a potluck at work, do you suggest tossing the salad with the dressing in the morning so the flavors have time to mix together or should I toss it right before we eat? I’m not sure if Brussels Sprouts will get soggy the same way lettuce does. Thanks, Megan — we hope you and your co-workers enjoy this! And yes, that’s exactly what we’d do (the brussels sprouts shouldn’t get soggy and will definitely be more flavorful). Yum! We are going to have to make that soon! Is it better if the dressing marinates over it for a little but if time? Just a heads up…this salad might not be for everyone!! I just made it to bring to a party tonight! It’s REALLY BLAND! I tried fixing it by adding some more orange juice to the vinaigrette. Still has no flavor. I’m sooooo bummed!!! We’re sorry you didn’t care for this one. 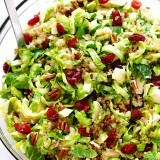 can this recipe be made a day ahead of time or will the Brussel sprouts get too soggy? I’m going to try this to serve alongside roast beef sandwiches for dinner tonight. I don’t have the ingredients needed or the Orange vinaigrette (bummer) going to try it with bottled poppyseed dressing instead. We think that sounds like an awesome combo, Cheryl! We hope you enjoy! Thoughts on substituting pomegranate for the cranberries? Was wondering .. do you mix all together while quinoa is still warm? Hi Barbara! We let the quinoa cool a little (just so it’s not piping hot), and then we’ll mix it. You can wait until it’s completely cooled though if you prefer. We hope you enjoy the salad! I have to agree with Jostlen, I LOVED the ingredients in this salad but the dressing had NO taste at all. I will try adding some more orange juice to it. Thank you though for your great blog! We appreciate your honest feedback, Kristen, and we’re sorry you didn’t care for the dressing very much! Definitely feel free to add some more orange juice and/or vinegar, and you could also add a little Dijon mustard or minced garlic if you like. We hope this helps! I completely love this salad! the flavors compliment each other perfectly, the textures are great, and it’s good for a week in the fridge! i had this for lunch every day and never got tired of it! Thanks, we hope you enjoy the recipe! Next time I might try raspberry vinaigrette instead of orange. Thanks, Debbie, we’re so glad you enjoy it, and we bet a raspberry vinaigrette would be delicious with this! Love this salad! Made for a Christmas party and used red quinoa, it was a hit! It was delicious the next day too. I made a couple of modifications to the dressing, a little more orange juice and a bit of honey. Making it again tonight for friends. WHAT IS THE NUTRITIONAL VALUE? Amazing salad! I just added a drizzle of honey to the dressing ! Love it ! Will make it again and again!